Hard To Find M Sport, One Owner, Inline 6 Engine, Heated Seats, Nav, Premium Seats, Nice!! M Sport, One Owner, Inline 6 engine, Great price point for an M Sport Package BMW. It is extremely hard to find any M Sport package BMW even under $16,000, especially a one owner and great condition with a clean carfax. The Only owner of this BMW M Sport is the person who bought it brand new and spent full sticker price on it. People never forget what they spent on a car brand new and they tend to take care of it night and day better than the people who didn't spend ALLL the money on it new. It was always A $50k dollar car out the door to the original owner even as it depreciated. We all wish we could buy them all "one owners" but that would be in a perfect world. The 328i models of the BMW has the signature/bulletproof inline 6 engine in the coupes up until 2013. It has been time tested and proven to be one of the strongest and long running engines of all time. In the 2012 328i sedans and the 2014 428i coupes went to the new 2.0L turbo engine. It seems like every car or small SUV on the market now days have some sort of 2.0T engine. It really takes away from the signature drive and equal power throughout that the inline 6 engine in the BMW's were known for. That is one of the main reasons that we love these year BMW's is because of the engine. The M Sport package is a must for any true BMW lover, and the value you get from the M Sport package you enjoy the whole time of ownership, especially that "M" steering wheel. Getting to hold on to that steering wheel every time you drive is worth the price of admission on its own. The M Sport package also gives you upgraded front and rear bumpers for a more aggressive and stylish look. The "M' wheels are tasteful and really go with the coupe body style perfectly. The upgraded suspension ONLY on the M Sport and Sport models, is much better than the base suspension and once again is what an "actual" ultimate driving machine should feel like. The charcoal gray exterior is rich looking and always looks clean even whens its dirty. Probably the easiest color to keep clean. It doesnt show small imperfections or swirl marks in the sun like a black or darker color would. Another huge value on THIS particular 3 series M Sport are the almost brand new Bridgestone run flat tires all the way around. That is AT LEAST a $1200 value to take into consideration. They also create a driving experience that is much better than worn down or cheap tires. The full window tint completes the exterior look of this M Sport. The interior is one of our favorites and we call it the "two tone" interior. Its not the yellow tan seats but the leather white seats that look rich and clean. The carpet is black which is a must, and will not show any stains like the lighter color carpet on cars that we do not buy. That is why we only buy the "two tones" for our lighter interiors because the carpet is black, along with the leather dash and door trims to create a one of a kind look from inside. We already talked about the M steering wheel but that is one of the best parts of the interior. Th M Sport package also give you the premium seating package as well. The seats are totally different than the non sport seats, and have much more bolstering to hold you in for the ultimate driving experience. They also look a million times better than the non-premium seats. All of these 3 series did not have heated seats, this one does! They did not all have the screen with navigation and all the other cool things that you can do on the screen. Not to mention when you buy a luxury car now days, you have to have some sort of screen. Only 60k miles on this car is nothing. With the inline 6 engine, it is just now breaking in. What a fun car to drive. With it being a clean carfax, ONE OWNER, LOW MILES, M Sport, inline 6 engine, all the right options, and "price Point", this M Sport checks all the boxes and makes it a one of a kind car in the market with all of these attractive attributes "combined." We also offer extended warranties and the 3 series BMW rate very low so they a surprisingly very affordable. It just helps create much more value and makes for a better all around car purchase. call or email with any questions or stop by anytime during our business hours. This is a west coast owned so there is no rust/corrosion issues! Dealers can buy cars from Illinois, New York, East Coast, Midwest Michigan ect with rust for $2500-$5000 less than the same car but from the west coast. Not only is this a west coast car its a 1 owner with no blemishes at all on the Carfax. No accidents or damage reported, minor damages, rental car, or odometer roll backs. 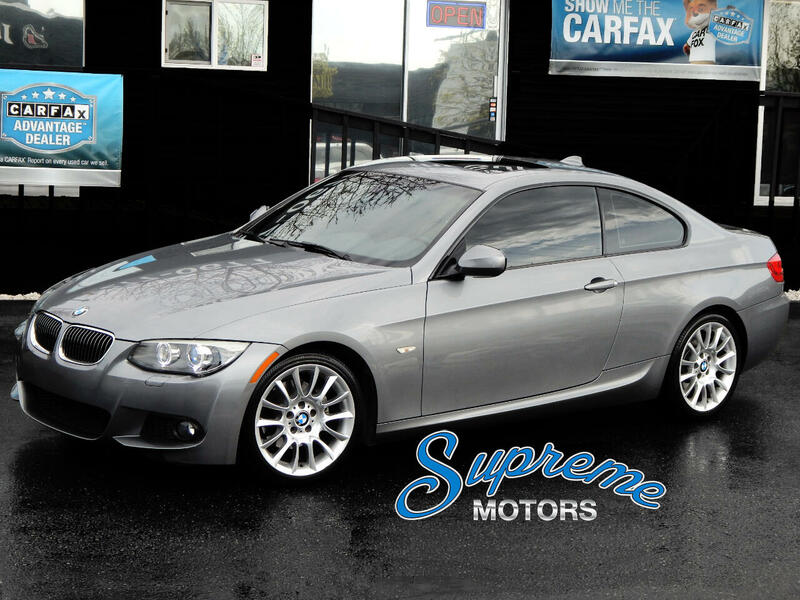 At Supreme Motors, we ONLY sell the best of the best and this M-Sport is another prime example of our meticulously inspected, clean Carfax, and rare optioned inventory that we select for our new clients. The must have M-Sport Package. If you dont know much about the M-Sport get ready to learn about why its EVERYTHING on any BMW. The M-Sports are way more expensive compared to the regular base or base sport BMW's and will ALWAYS be worth way more than the dime a dozen regular models because of all the upgrades you get and the rarity. The exterior gets a fully redesigned front and rear bumpers that totally change the whole look of the car. Add in the top optioned M Wheels and you get one of the most desirable exteriors in the game. The mixture of sport and luxury is amplified to the max with the M-Sport Package. The interior on the M-Sports give you the nicer seats and M steering wheel. GAME CHANGERS! Its only what you sit in, and hold on too the whole time your in your investment. The higher quality leather is the first thing you notice, and at closer inspection you will realize how much nicer they are, or just sit in the base model right after you sit in an M-Sport with the seat package. You wont want to get out of the M-Sport. All of the M logo's on the wheels, steering wheel, and door plates let everyone know this 3 series is special. These headlights are a MUST if you want a car that will stand out AND that are way brighter at night. They are truly game changers if you have a hard time seeing at night. The headlights are one of the most important option's in our opinion AND its the only way you get BMW's signature halo's. All the other 3 series with the base headlight package look like 2001 Kia headlight especially at night. The base headlights are almost yellow compared to the much brighter hyper white bluish HID package headlights. A clean Carfax is everything especially when its 1 owner like this BMW. With the low miles, M-Sport, options, price point, and history it makes this M-Sport EXTREMELY rare.